One of the best catches in my Lucca expedition was Strange Tales of the Century, by Jess Nevins. This massive 500+ pages trade paperback is two things into one – and both are just great. 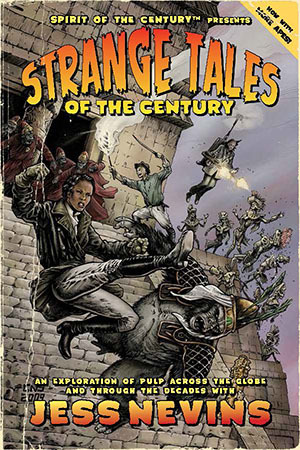 Strange Tales of the Century is a supplement for the Spirit of the Century roleplaying game of pulp action and adventure. As such, it offers the reader a wide selection of characters, options, new stunts and perks and what not. It also details the world between 1935 and 1951 from a pulp-fictional point of view. I personally do not play the FATE System or Spirit of the Century, but the sourcebook is flexible enough to act as a much needed supplement for the old Aeonverse game Adventure! (that’s how I’m going to use it), or as a sourcebook for any other pulp/adventure game. But there’s much more – Nevins, a well known historian of the pulps and more generally of popular literature (we’ll get to that), fills the book with a true encyclopedia of pulp characters. For each proposed gaming archetype, we get a nice selection of literary examples and variations on the theme. This, together with the bibliography, is enough to make a pulp fan to scream in joy (and financial pain). The author pulls his references from a world-wide survey of the pulps – so yes, you get lots of Other People’s Pulps in there. Mounties and Legionaries, Spinster Detectives and Planetary Heroes, Big Game Hunters and Brains in Jars, here’s everything – and then some! Reading and digesting this book will take weeks – but it will be well worth the time. Strange Tales of the Century is also an ideal companion to Jess Nevins’ acclaimed (and expensive!) 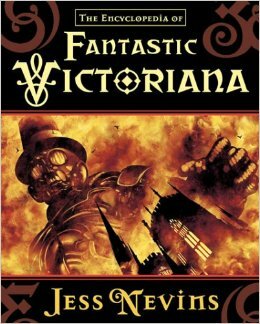 tour-de-force, his Encyclopedia of Fantastic Victoriana which Monkey Brains Press published in 2005. The 1200 pages hardcover weights a ton, has a wonderful (and probably bulletproof) cover, and gives us a complete rundown of all the heroes (or anti-heroes) of popular literature of a fantastic bend from the Victorian Era, and from all over the world. I got my copy back in the day – and it was with a certain surprise I found (as I looked for the picture you see here on the right), that the current selling price of the tome is 357 euro through Amazon.it. Both volumes will now make a fine display of themselves on my bookshelf – and they will be a continued source of inspiration and wonder. Categories: Other People's Pulp | Tags: Encyclopedia of Fantastic Victoriana, Jess Nevins, Spirit of the Century, Strange Tales of the Century | Permalink. If you knew how much I envy you the Encyclopedia of Fantastic Victoriana. I spotted this book but it costs too much. If you need some easy money you should consider reselling your volume, not kidding. Yes, it’s commanding some pretty high prices. And actually, it is such a great resource, that it would be one of the last books I’d put up for sale in case of necessity.